As a rule, it’s time to store your coats and garments when it’s too warm to wear them. In the Carolinas, fur storage season starts in April. 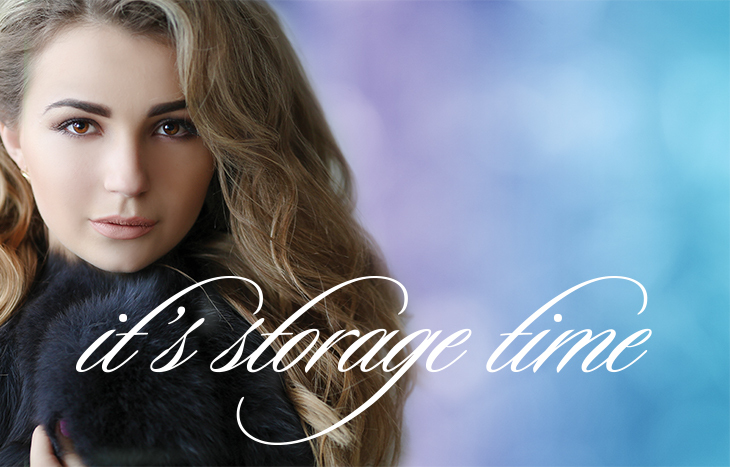 Cold storage is one of the most important things you can do to care for your fur, shearling and cashmere garments. Kriegsman’s on-premise cold storage protects the longevity and value of your luxury outerwear, so you can enjoy it season after season. If a coat is kept in an area with low humidity, the natural oils will evaporate quickly causing the garment to become dry and brittle. If the humidity is too high, the pelts can rot quickly or mold. We strenuously caution against storing your fur in a freezer! As the leather pelt freezes, it contracts – and when it thaws, the pelt expands – which causes stress on every seam in the garment and damages your coat. Kriegsman’s cold fur storage provides the proper temperature and humidity to prevent loss of natural oils and deterioration of pelts. Every year we see fur coats and cashmere coats with moth damage because garments were improperly stored in custom cedar closets. The only fix for moth damage is pelt replacement, which is an extremely expensive repair. Cashmere coats and fine woolens have to be re-woven. Adding mothballs to home storage is never recommended because the fur and lining absorb the odor and is nearly impossible to remove. Kriegsman’s has been selected as an Authorized Furcare Specialist by the Fur Information Council of America. We service many North Carolina cities with local events to help you with your garment maintenance. Look for us in Asheville, Danville, Hickory, Pinehurst, Raleigh and Winston-Salem. Have your fur cleaned every year to remove airborne particulates, dust, dirt and makeup that collects on the hairs of the fur. Day-to-day accumulation of dust and pollutants can draw the natural oils out of the pelts causing the fur to quickly dry out. As the natural oils dry out, the pelts become tender and brittle which causes rips and tears, making the garment useless. Don’t worry if you get hairspray, makeup, perfume or food on your fur garment. Professional fur cleaning will quickly and gently remove the dirt and odor leaving the fur fresh and luxurious. Remember, fur cleaning is not the same as dry cleaning. We have on premise materials and equipment specifically designed for the fur cleaning process and our staff has the expertise to provide the best care for your furs. Bring your garments in for complimentary evaluation today! We can repair or alter your garment. Altering and repairing fur coats requires the expertise of our professional on site staff using specialized equipment and skills. Our Master Furrier can adjust sleeve length, move fasteners and shorten the hem which gives you the perfect fit on your fur garments. Our team is trained with the proper methods for cutting and sewing fur for a perfectly finished garment. We also repair and alter shearling, leather, cashmere and fine woolen garments. Bring in your fur coats today for a free consultation with our Master Furrier. Over time, furs that are light in color can oxidize and change. We offer a unique color restoration technique that can lighten and brighten to refresh the dull color. Bring your fur in for a consultation with our Master Furrier.